Aryeh Kunstler is a rising star in the Jewish music scene. With his virtuoso guitar talent and a collection of well written, soulful, catchy songs, he has captivated audiences both here in the U.S. and in Israel for the past five years. Since the release of his debut album, “From The Depths,” Aryeh and his band have developed a reputation for their energetic live shows and their ability to entertain and captivate audiences across the broad spectrum of Jewish life. 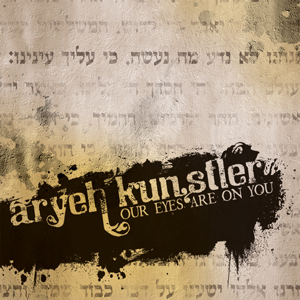 Now, with the added talent of legendary drummer and producer Nir Z, Aryeh is set to release his second album entitled “Our Eyes Are On You” . This new collection, once again brings Hebrew and English lyrics together, in a polished performance that blends the highest studio production levels with the depth and meaningfulness of Aryeh’s heartfelt and talented songwriting and singing.